Woop woop, go me, I've now hit 1000 subscribers on YouTube!! 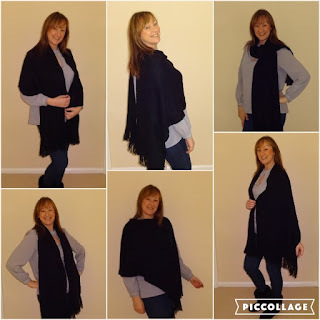 So to celebrate and to thank my followers I'm holding a **GIVEAWAY** for an Avon Black Cashmiele Isabella Multiway Cape. I have this scarf/shawl and it can be worn in many ways. The black knit is Cashmiele which is acrylic with a luxuriously soft feel, a bit like chenille. Check out my video demonstration below. For your chance to win, fill out the Rafflecopter below, open Internationally.